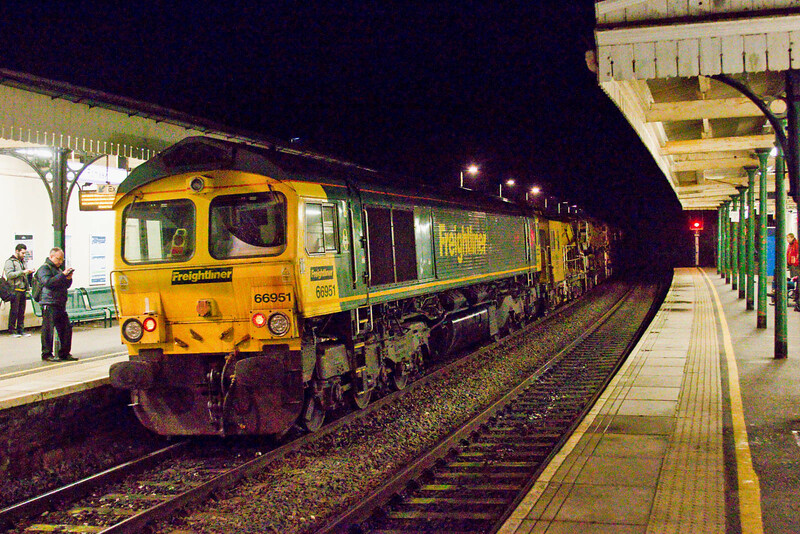 The incident appears to have occurred in the earlier hours of Saturday morning at Ivybridge in Devon, while in an engineering possession. 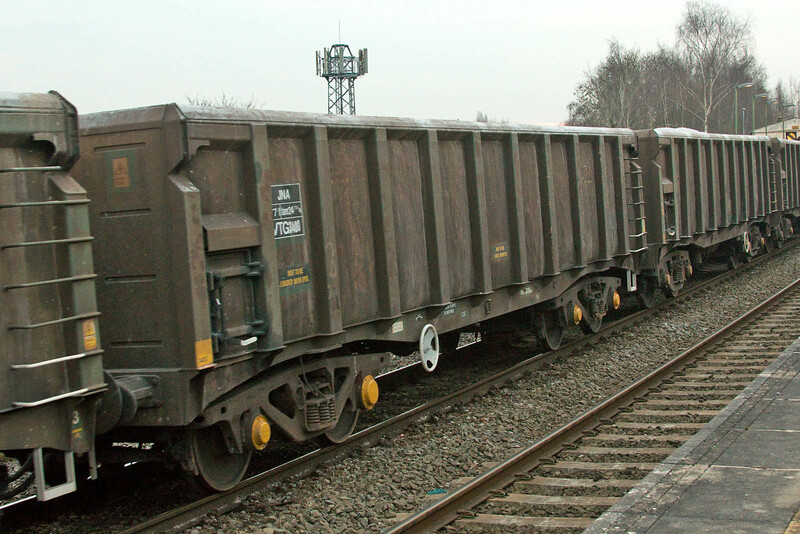 One or two wagons and 70803 became derailed, and there are reports of collision damage to the locomotive. "both drivers are ok, shaken but ok"
"rerailing equipment from Wigan is being sent to assist as local resources aren't sufficient"
"It would appear that 70803+6C24+70808 has hit the rear of 7Y75. 70803 has fortunately remained upright"
"it could take 12 hours just to get the loco back on as there are no rails left under it that you could get wheels onto atleast, they are both ripped from the pandrols, crippled and on their sides. 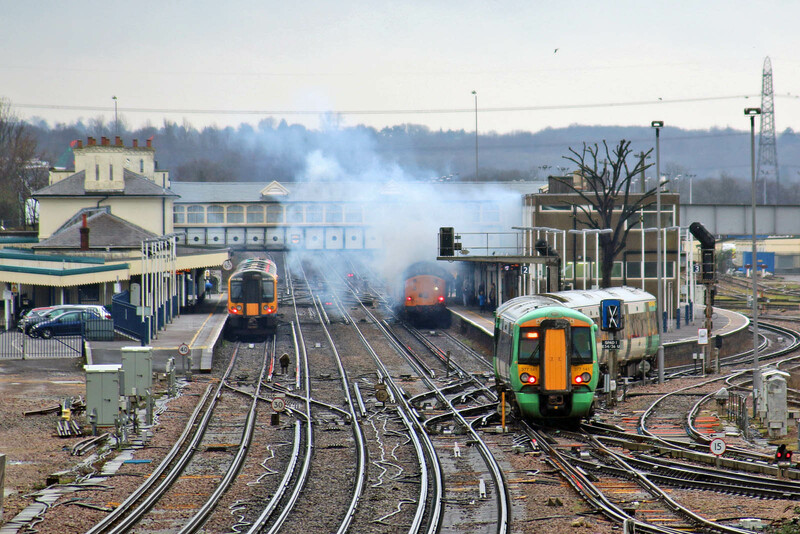 "There is also no buffing gear left on the loco (some of it on the floor, the rest of it broken) which wall also make onward movement to any where tricky until that's sorted." "The loco worked to Tavi(stock Junction) under its own power inside the possession last night but will need some repairs before onward movement." I think for the first time working on a Saturday. 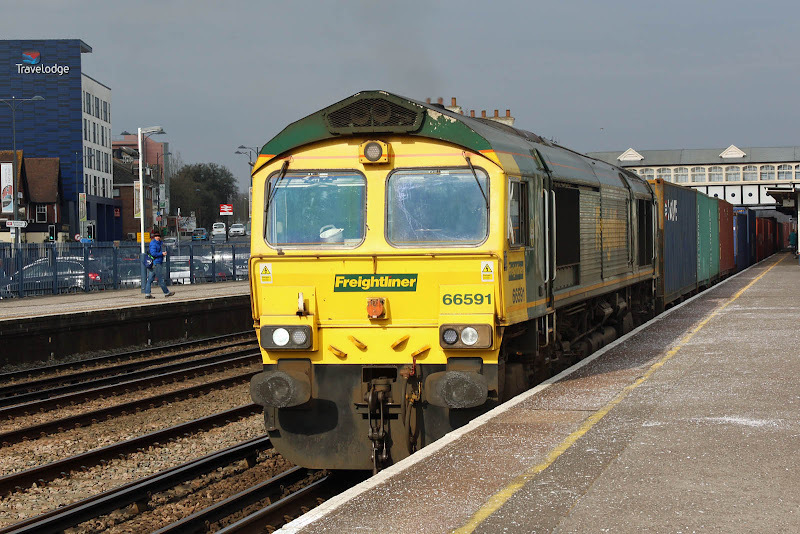 The working had come south from Dowlow Briggs Siding to Wembley on 26th with 66130. 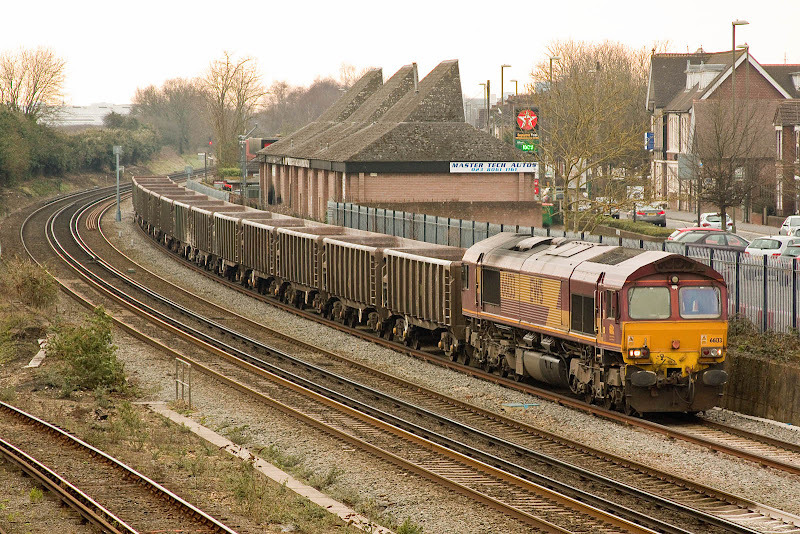 Passing Romsey in the morning, passing at 07:22 about 26 minutes after sunrise. 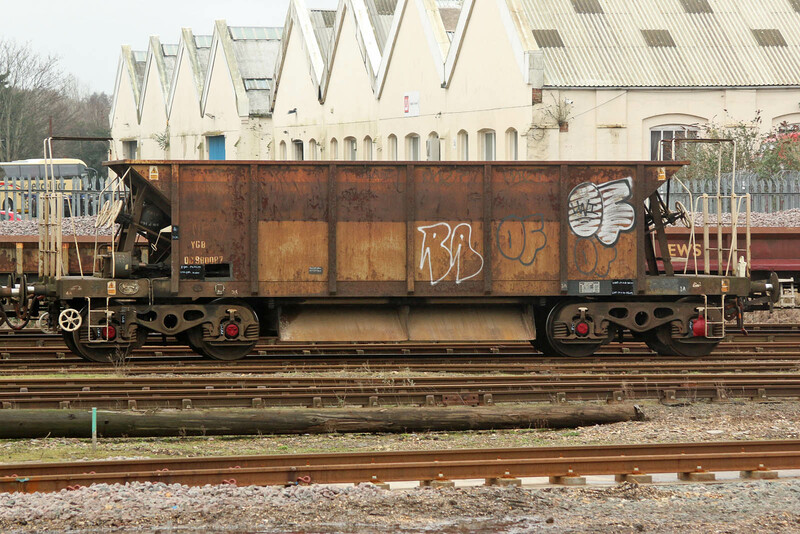 The train consist was of 14 JNA wagons, this 34xx batch being converted from 8xxxx series TEA bogie tank wagons by Marcroft in 1998 for Railtrack usage under CAIB ownership. The current owner is VTG and these appear to be in use in Tunstead and related diagrams. 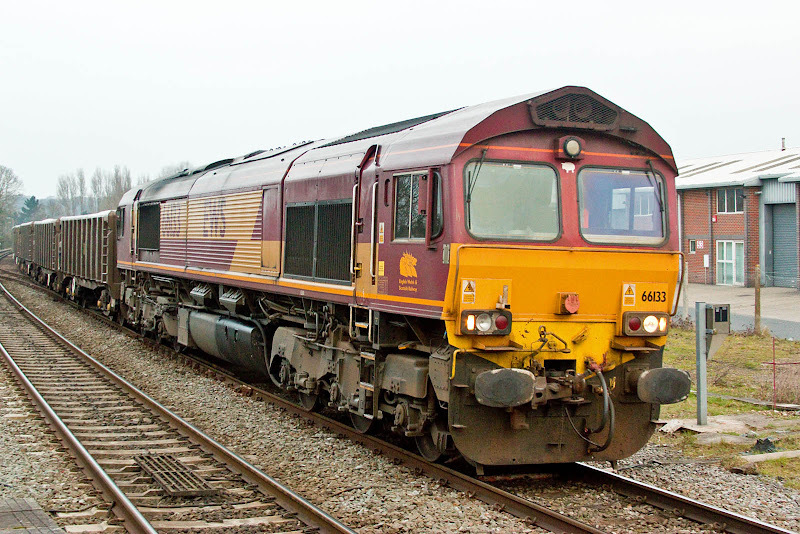 Leader of this batch 3400 is pictured. Some more details on the type in this accident report. 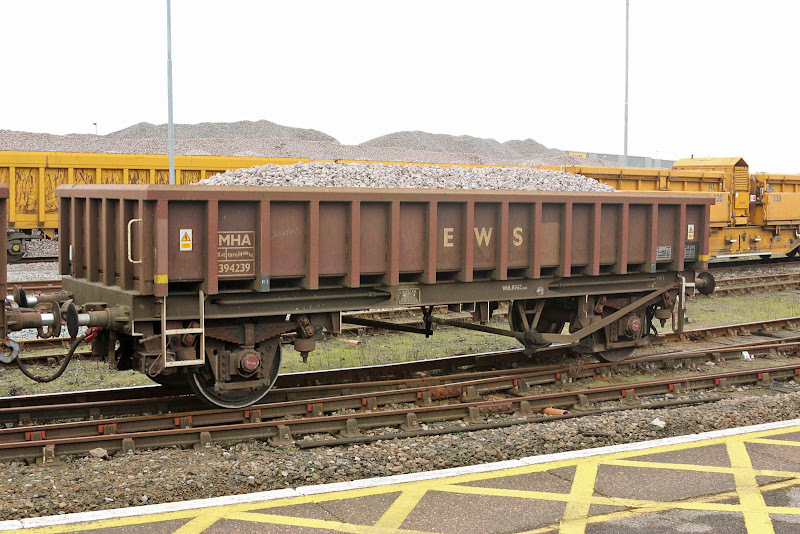 The last wagon was 3452. 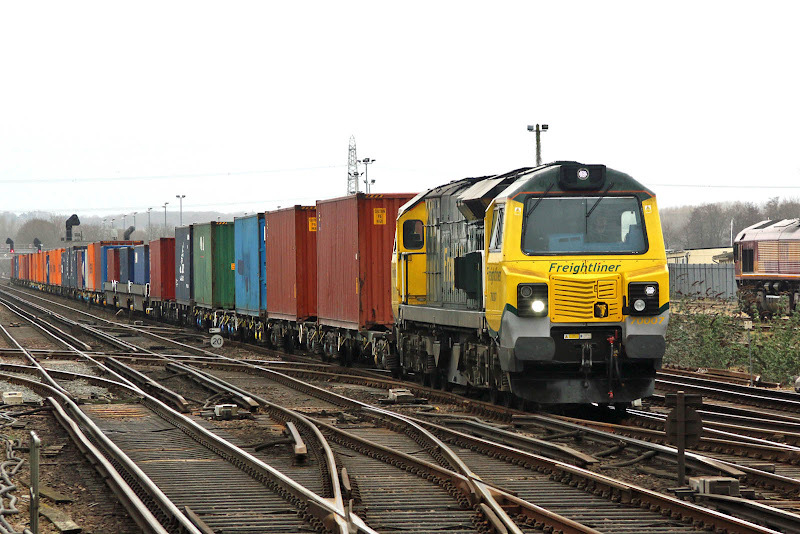 The return working ran early on its first leg, and was approaching Eastleigh, on the new track, at 14: 48. The subject here is 3411. with 3412 preceding. 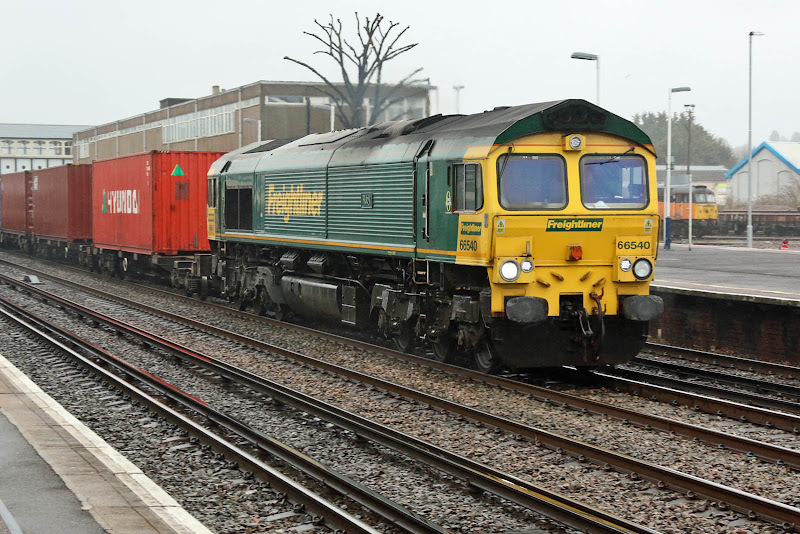 66593 3MG MerseyMultimodal Gateway on 4O14 07:37 HamsHall - Maritime. 66199 shunting a container consist, which earlier was in the East Yard - arrived as 4O43 06:31 Birch Coppice - Eastleigh Yard. 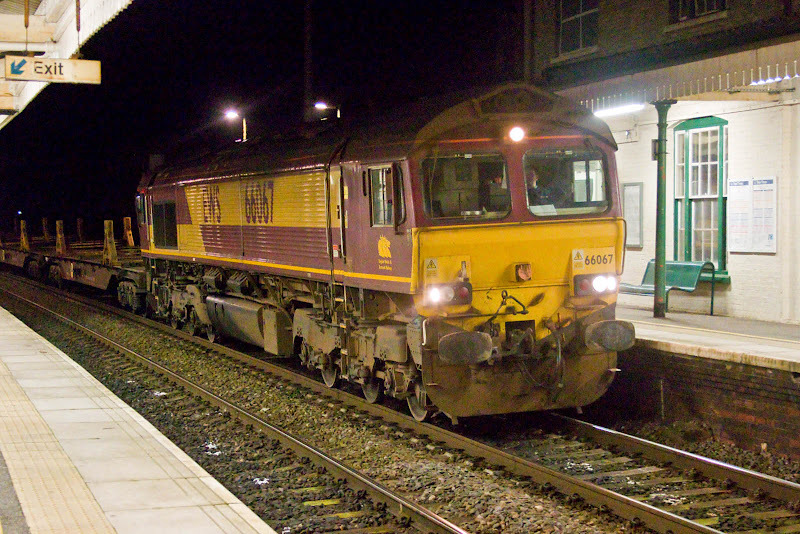 66591 4O54 05:27 Leeds - Maritime. 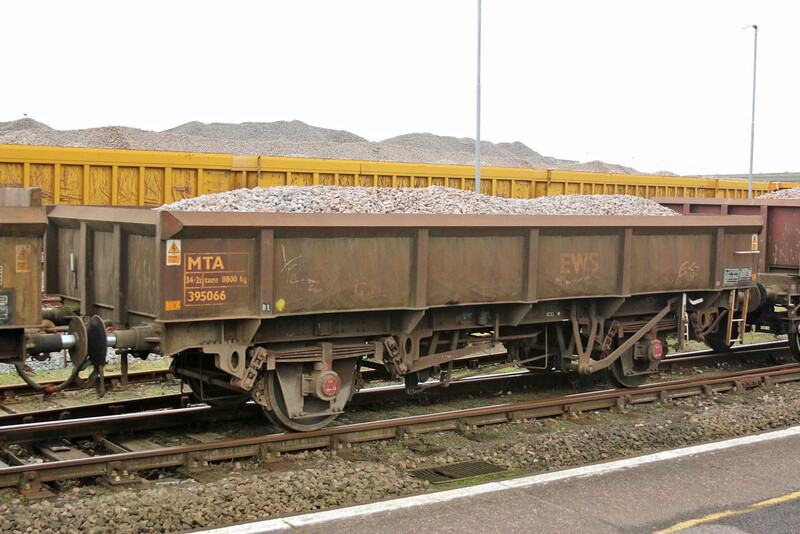 ZCA 'Sea Urchin' wagon 460224 - built upon the chassis of a SPA steel plate carrier wagon constructed at Shildon in 1979 to Lot 3939. 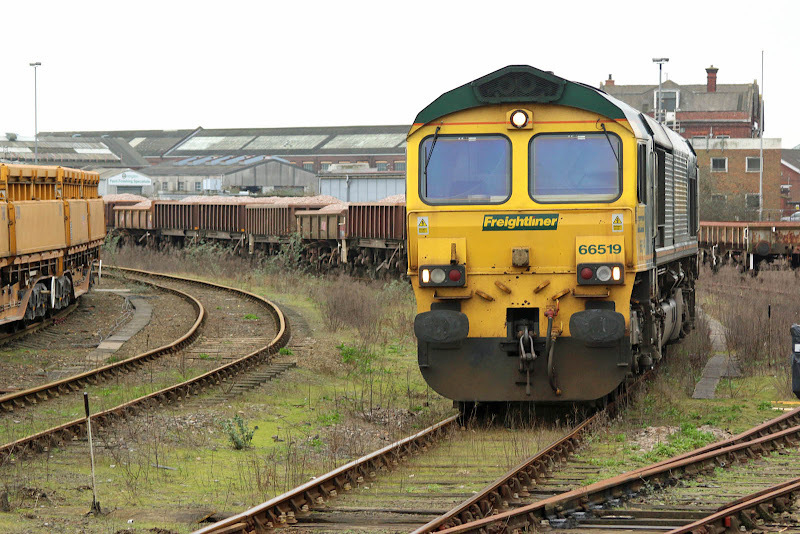 66770, delivered in December 2014, and into traffic in March 2015. Friday 26th February: 70810 + 47739 6Y48 09:01 Eastleigh - Hoo one two three four; 08696 moved by road from Eastleigh Works to Wembley. 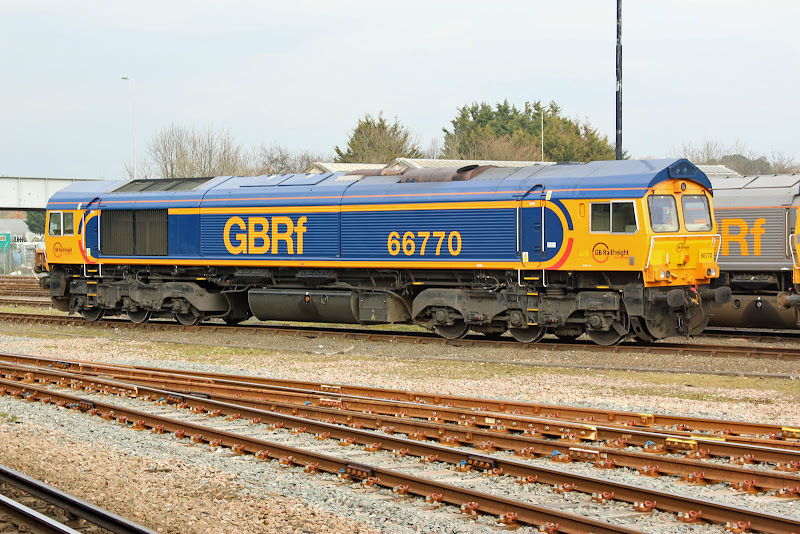 66067 seen over the fence next to Lidl. 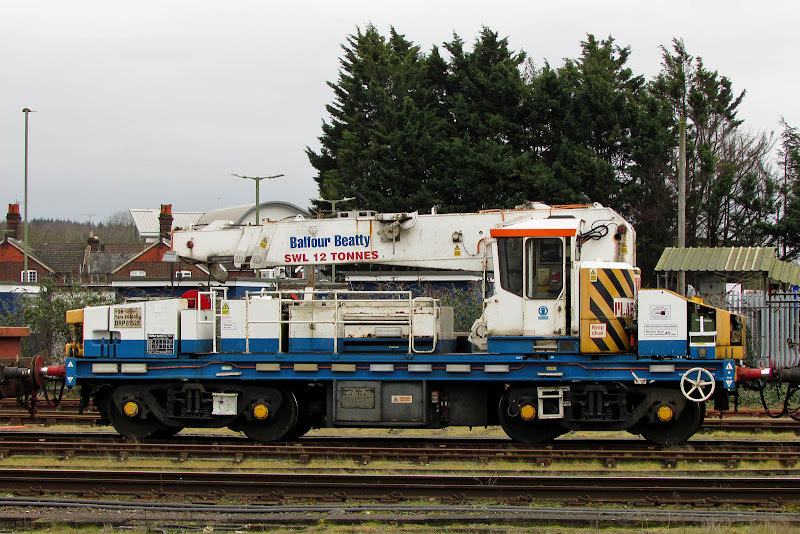 DRP81525 is a Plasser & Theurer heavy duty diesel hydraulic crane (number 5523 of 1981), originally operated by the BR Civil Engineer and designed to handle switch and crossing renewals as well as general permanent way functions. 158881 diverges for Romsey as 66955 approaches with 4O14 07:37 HamsHall-Maritime, which stopped in platform 3 for a crew change. 70007 passes through at speed with 4O27 0521 Garston-Maritime. 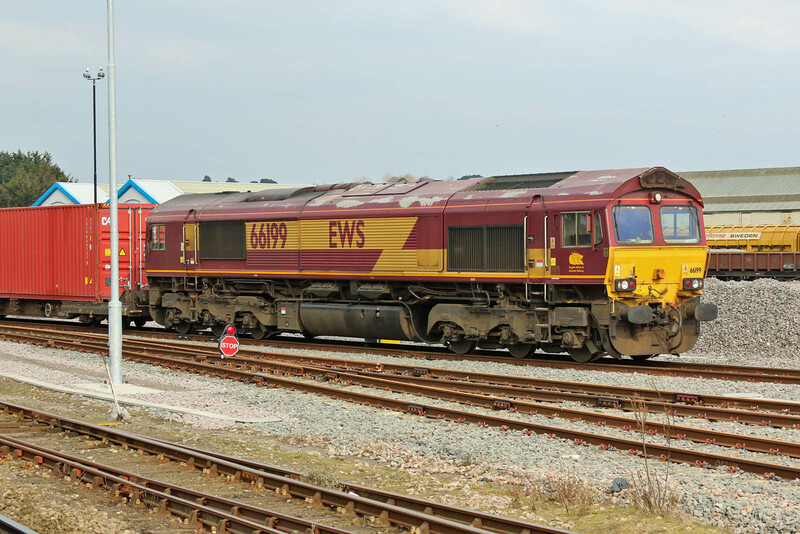 Now a real survivor, 08904 shunts in the yard. New as D4134 in June 1962 from Horwich, allocated to 14E Bedford. DB980087 a YGB 40 tonne 'Seacow' ballast hopper built at BR Shildon to Lot 3966 in 1981-82. The earlier 'Sealion' of 1970 was developed from the SR 'Walrus', itself developed from an LSWR desig of 1903. 70019 departs with 4O54 05:27 Leeds-Maritime. 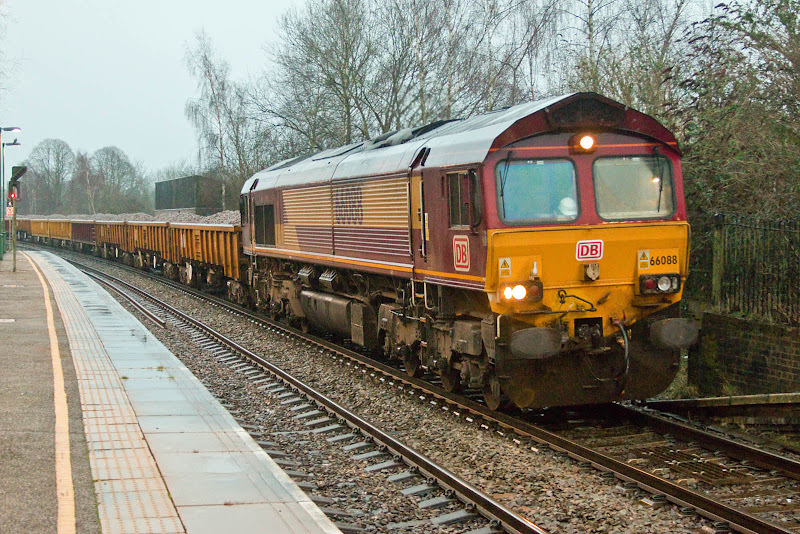 66540 Ruby passes in light rain with 4O29 08:15 BasfordHall-Maritime. 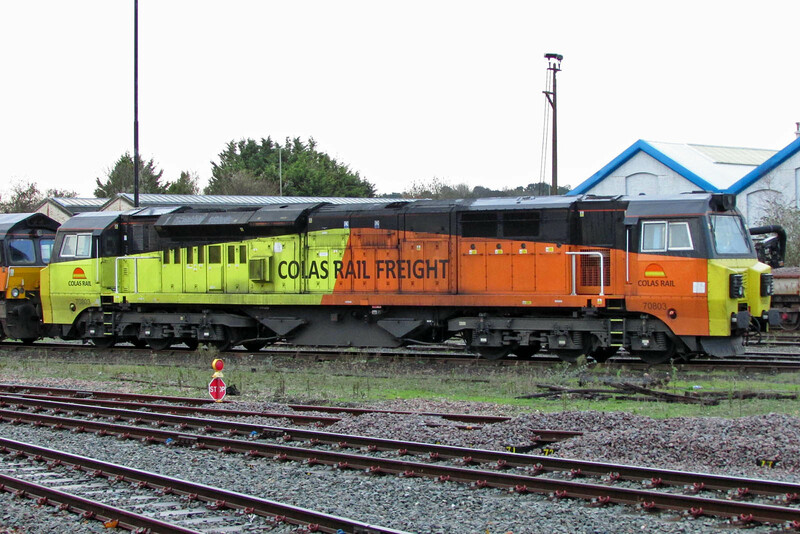 The locomotive name was applied in January 2006 to mark the 40th anniversary of Freightliner. 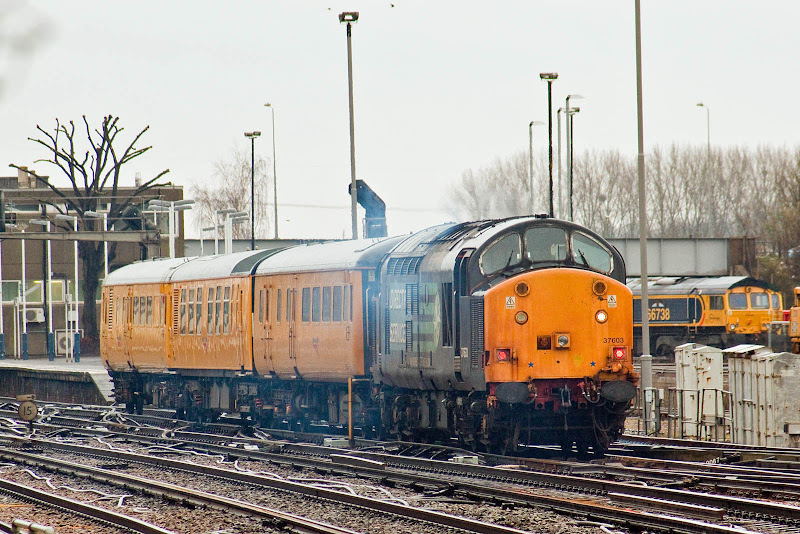 47739 Robin of Templecombe, at Eastleigh, 20th February. 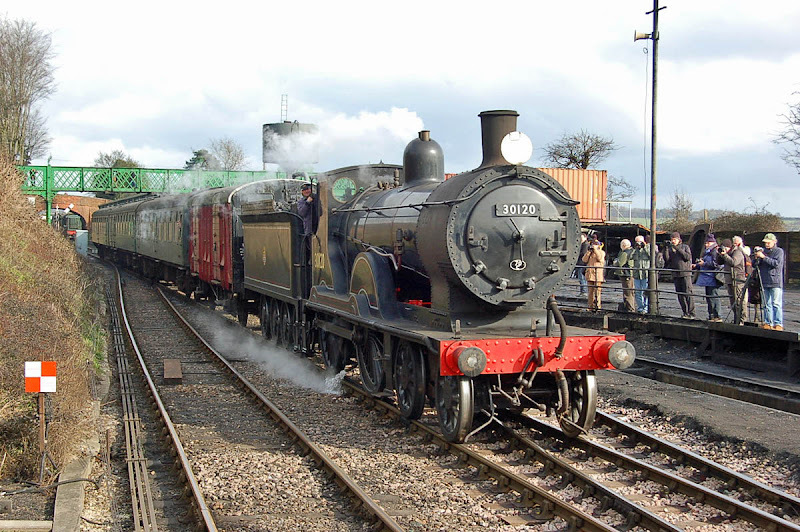 The locomotive entered traffic as D1615 on 29th August 1964. Car 70660 was built and delivered in 4-CEP unit 7205 as a TSK (Trailer Second Corridor) in December 1962, as part of Lot 30710 from BR Eastleigh, on frames built at Ashford. Refurbished as a TSOL into 1620 November 1983. 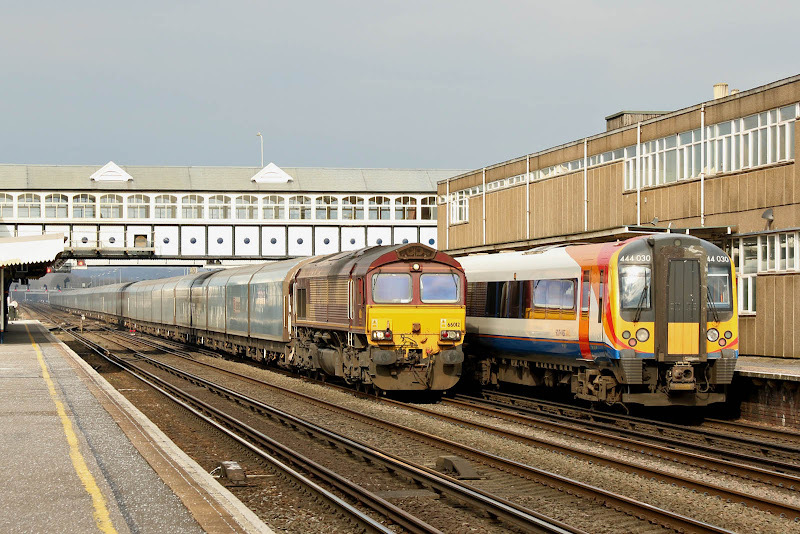 This became departmental 932620 in January 1993 and was used for central door locking trials, later equipped with overhead line pantograph as part of test of the Onyx drive system for the Juniper EMU fleet, but came out of use at least by 2001, latterly the coaches were used for trial liveries. Scrapped on site by Robert Nicholas Steels in November 2005. Four images from Ian Knight. SR Maunsell Q 30541 at Ropley. 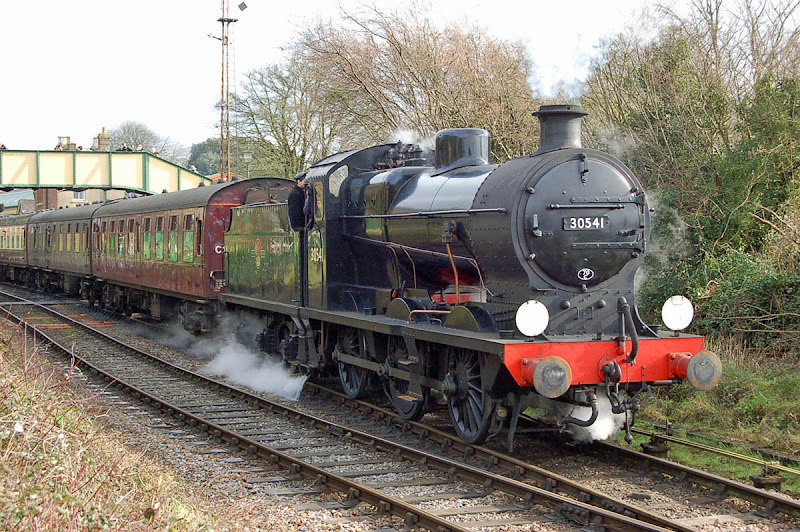 LSWR Drummond T9 30120 arrives at Ropley. 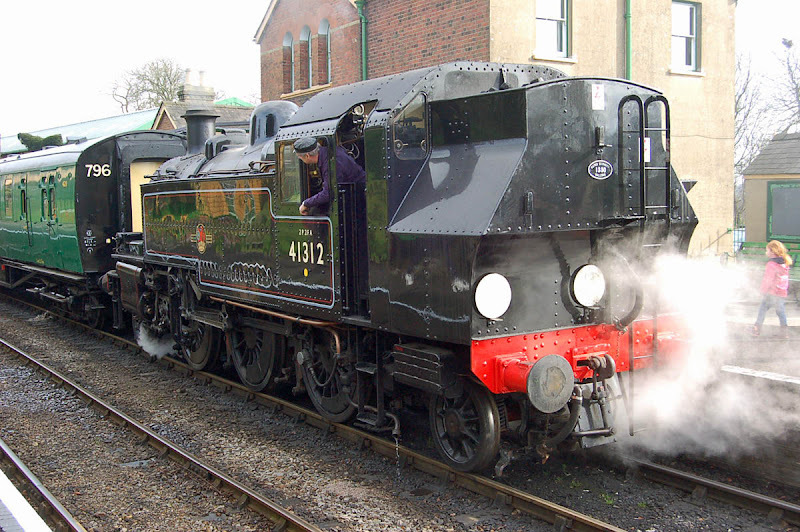 LMS Ivatt 2MT tank 41312 at Ropley. 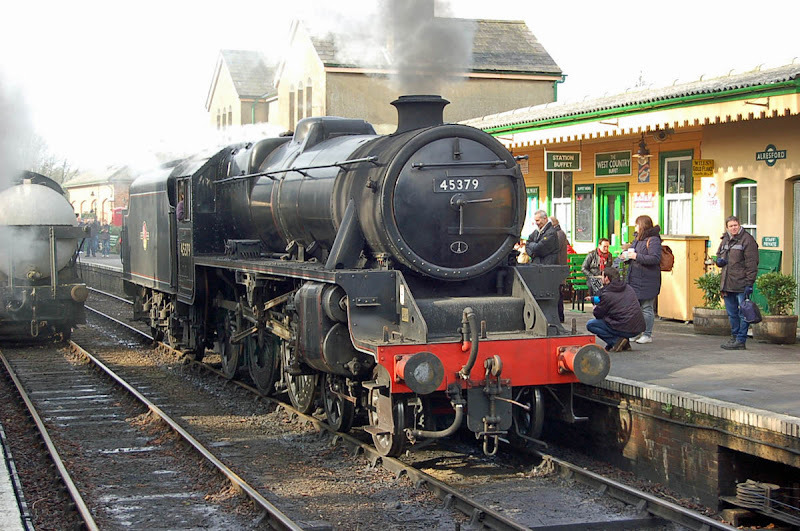 LMS Stanier 5MT 45379 at Alresford. 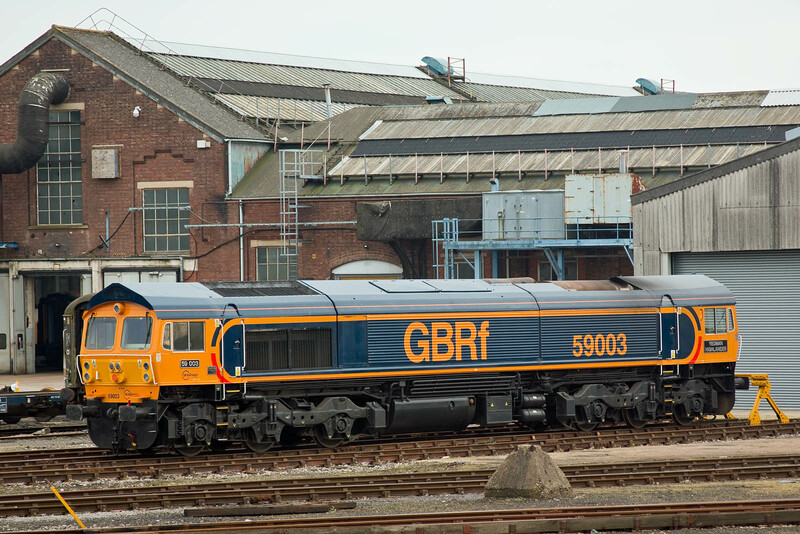 37603 was completed new from English Electric Vulcan Foundry as D6739 on 18th May 1962, and allocated to 50B Hull Dairycoates. Air brakes were fitted in August 1971. It was renumbered 37039 in February 1974. 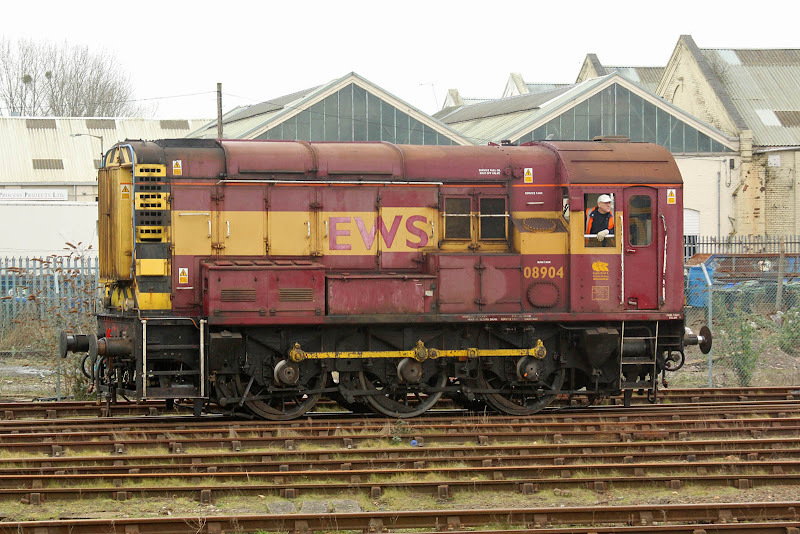 Entered Crewe Works for Heavy General Overhaul in September 1985, and emerged as 37504 in March 1986. Renumbered 37603 in May 1996 and transferred to European Passenger Services, then to DRS between November 2007 and February 2008. BSO 9523, from BR Derby Lot 30861, entering traffic in June 1974. Since January 2013 operating for Network Rail as a Staff Coach /Brake Force Runner. 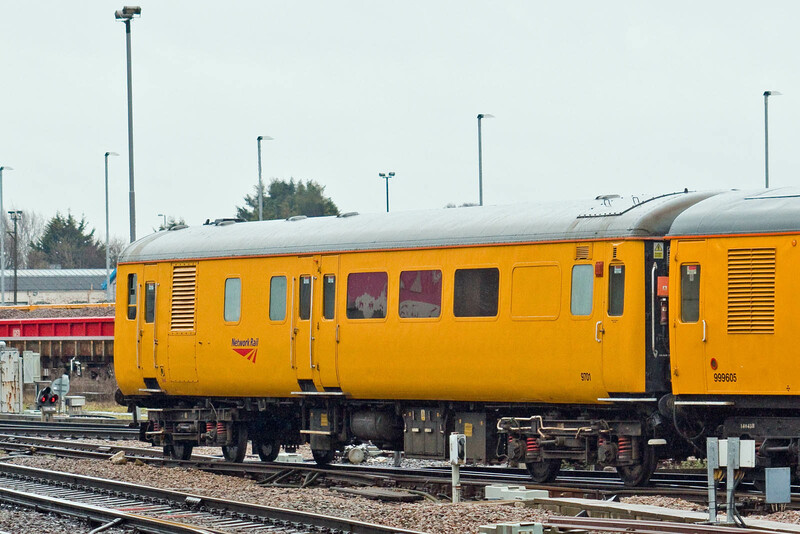 Ultrasonic Test Train coach 999605 has been through repairs and repaint since last seen in June 2013. Built in 1974 as 62482 and saw service in last build 4-REP 3015. 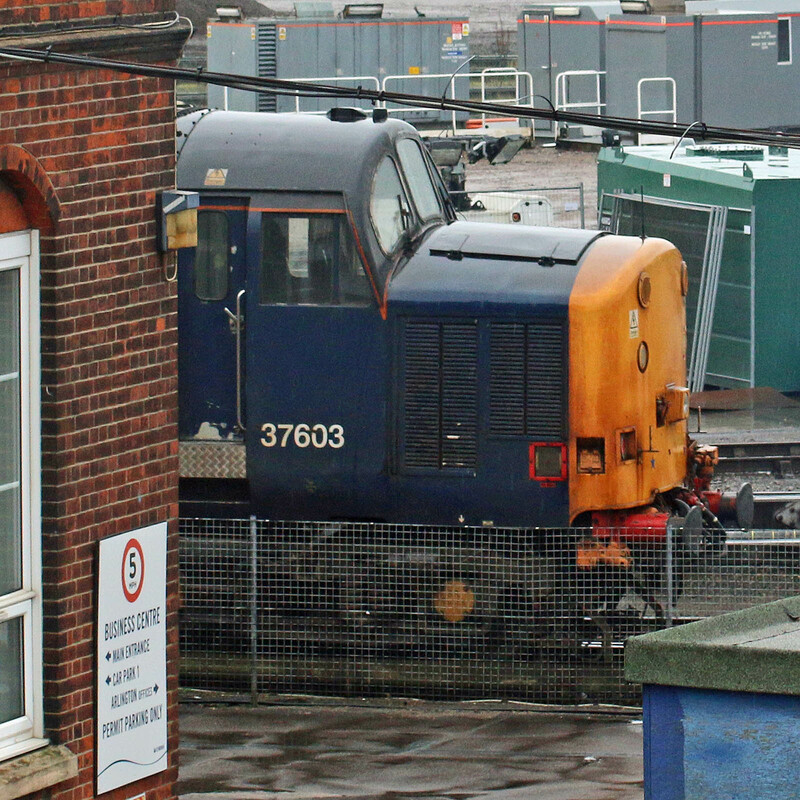 37603 is pushing through the works towards the exit. 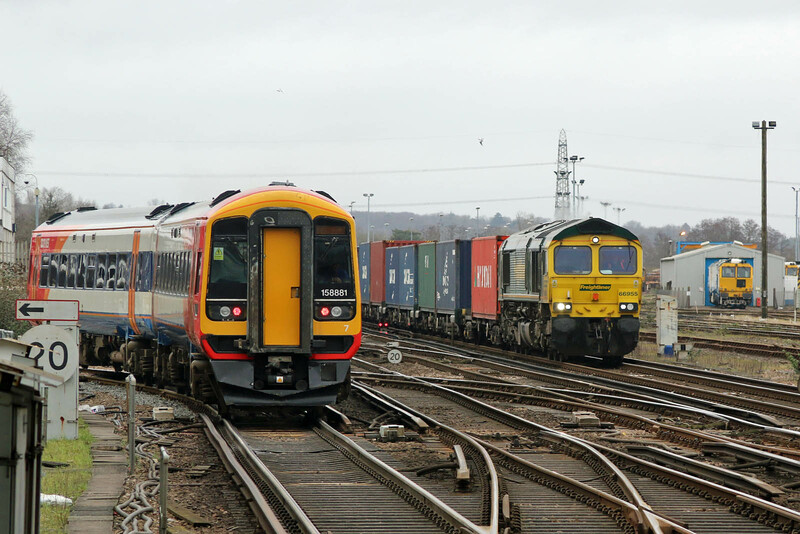 Since 37601, 37603 and 37604 spent more time idle with EPS, they have the lowest engine hours in the DRS fleet, and in early January this was 6251 hours, which compares with more than twice that number for locomotives now being disposed of. 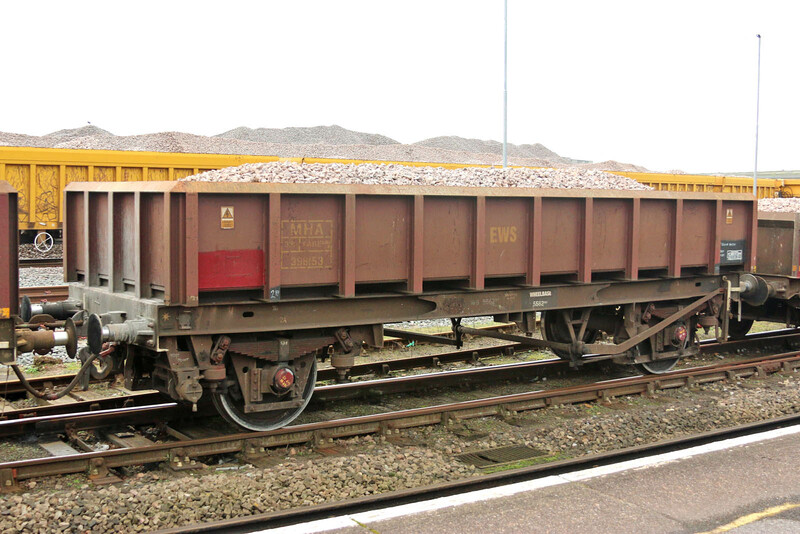 Driving Trailer Coach (formerly DBSO) 9701. 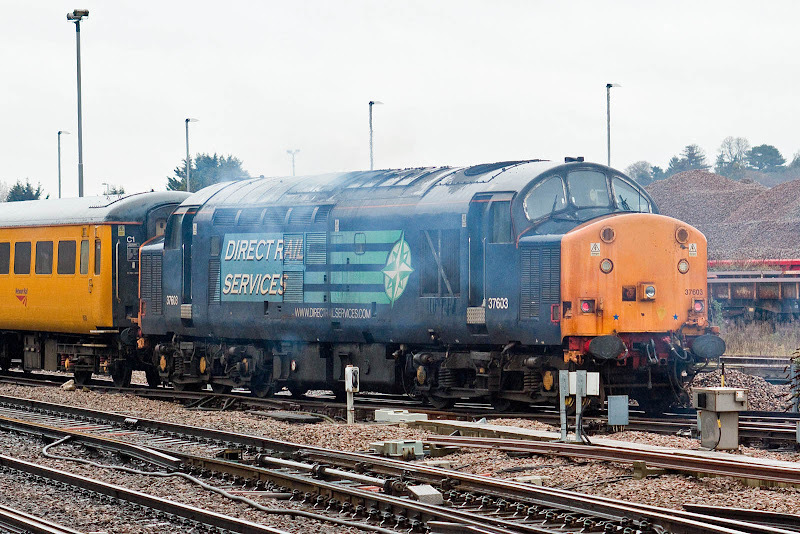 37603 lays down some smoke as it moves the train slowly towards the station. Approaching the platform. Rather unusually, one marker light was on while red lights were displayed as expected - this was resolved before Reading: one two. 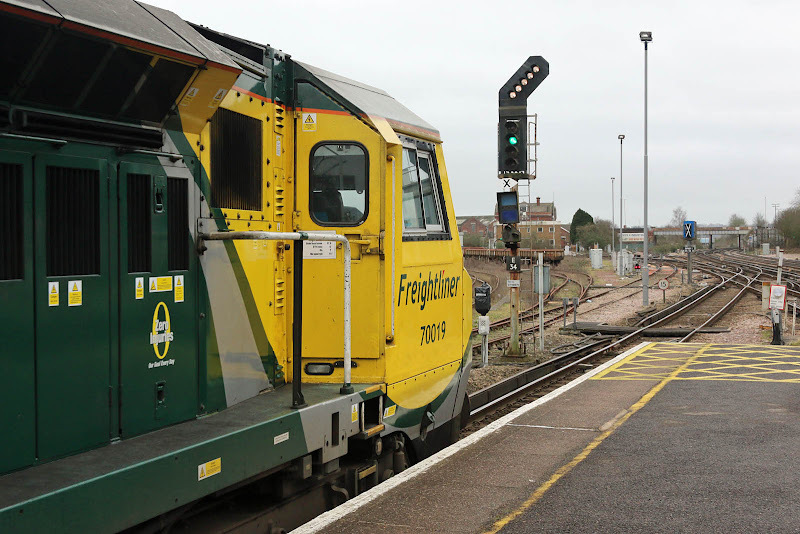 The departure from Eastleigh station was 40 minutes early. 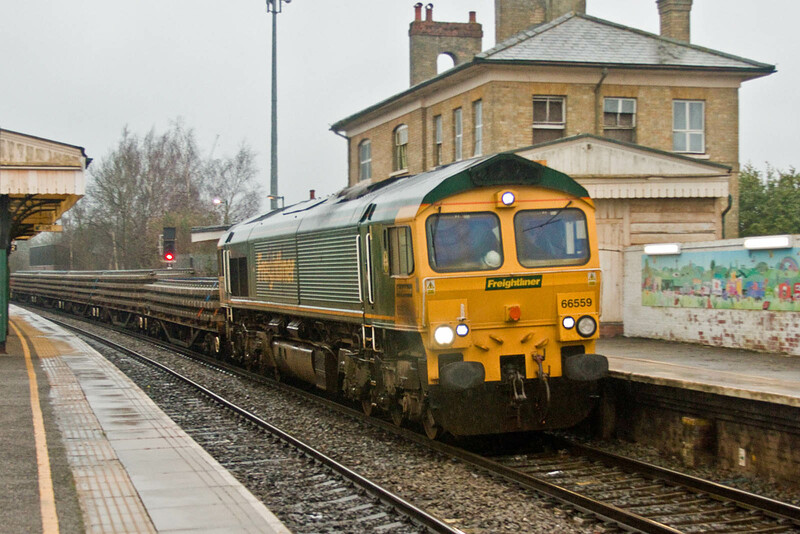 66088 draws into Romsey with 07:16 Eastleigh - Romsey, which, after a short break, proceeded into the section. 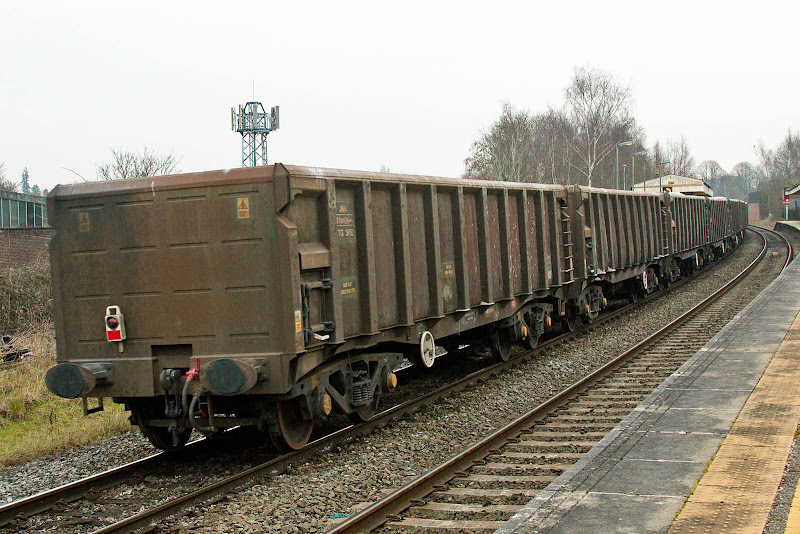 MLA 503518 (Wagony Swidnica, 2008) loaded with fresh ballast. JNA NLU29381 (Astra Vagoane, Romania, 2003-05). 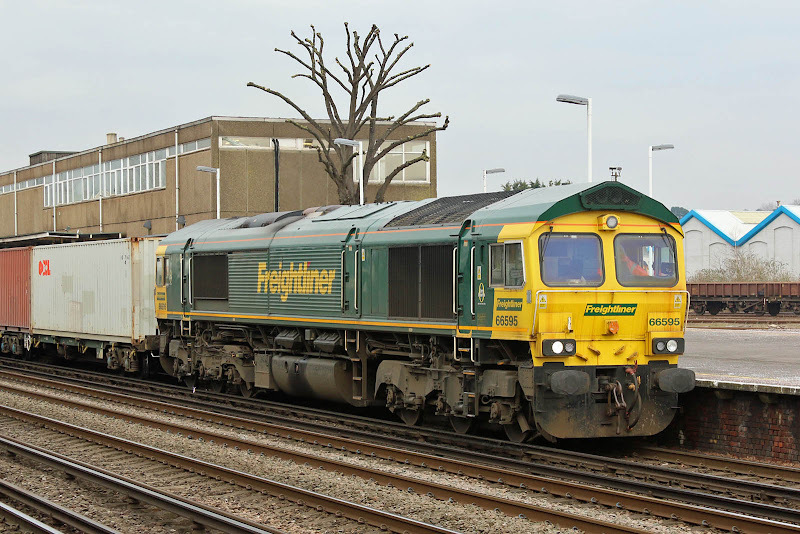 Nominally running one hour later, 66559 passes the station with track panels 6Y81 08:17 Eastleigh East Yard - Romsey, moving onwards directly. 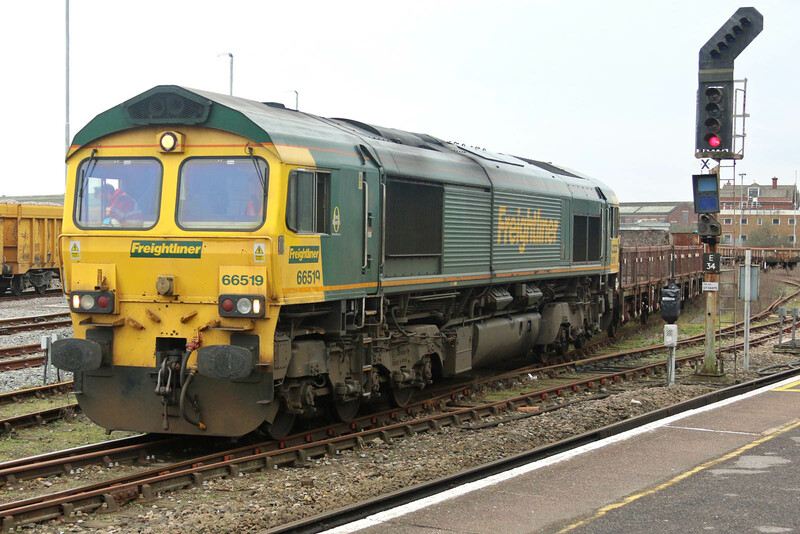 This locomotive worked from Crewe to Stoke Gifford on Thursday, and onward to Eastleigh on Friday. 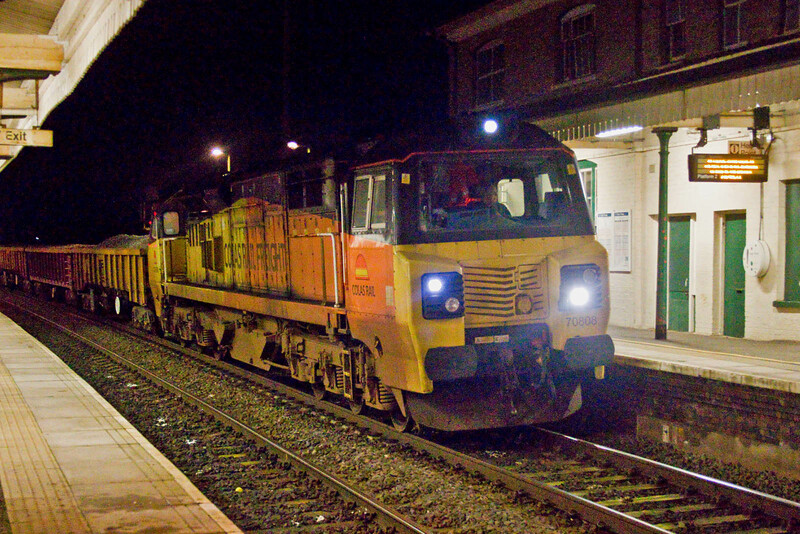 70808 with 6V31 20:13Eastleigh - Westbury. This week's news brought news of an earlier than expected closure for most of Fiddler's Ferry Power Station. 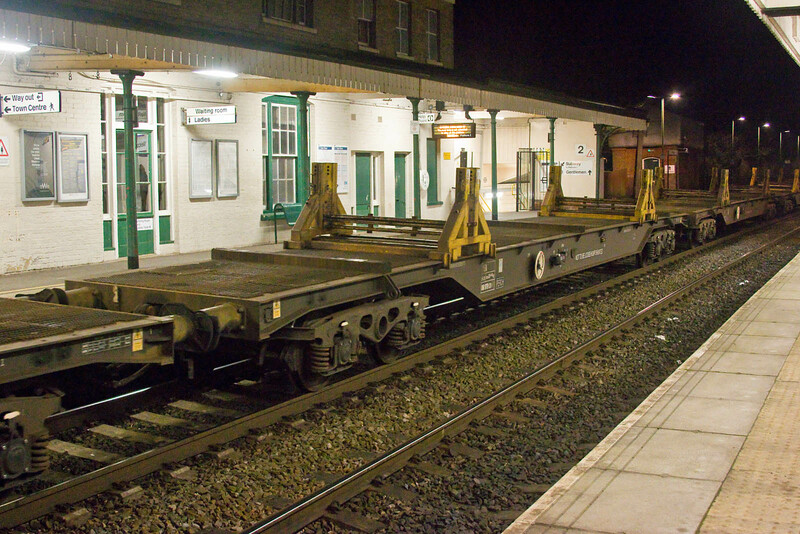 Updated: 11Feb to reflect Rugeley closure. Not intended as a definitive list, but to give scope to the downsizing of merry-go-round operations which we have seen over the last 50 years. 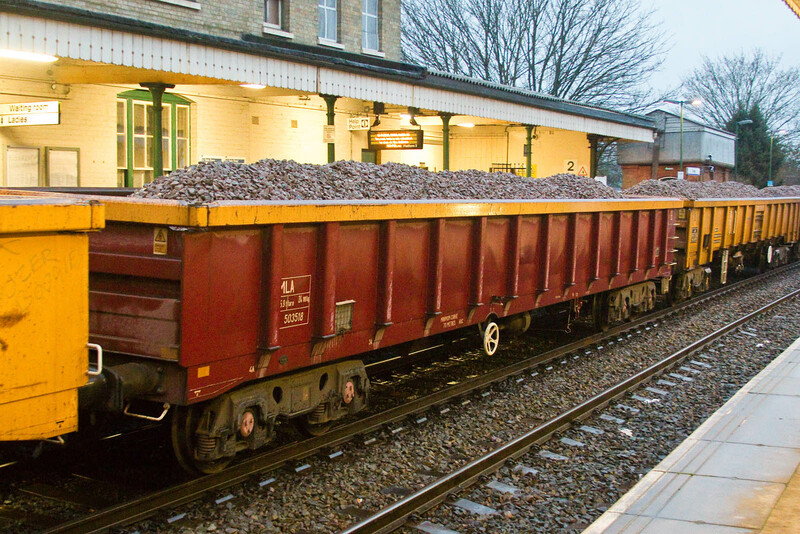 A transition to gas will reduce railway traffic, and we already hear of modern coal hoppers being sent for scrap, Unfortunately this can only be expected to continue, as more than half of our recent historical coal fuelled capacity will be closed by April. Of the total of 20.5GW nominally available, going into winter 2015-16, 9.9GW will close by April - 48%, although 0.8GW is to be kept in reserve at Eggborough. This equates to about 20% of typical UK demand, which can be monitored here. As I write this on a Sunday afternoon, with comfortable temperature for February, coal is providing 5.4GW into the National Grid, this has however peaked at 14 to 15GW during the recent coal snap - and we will only have 10GW nominal total capacity next year. With the announced closure of much of Fiddler's Ferry, and that at Longannet, the future of Hunterston deep water facility again appears challenging. 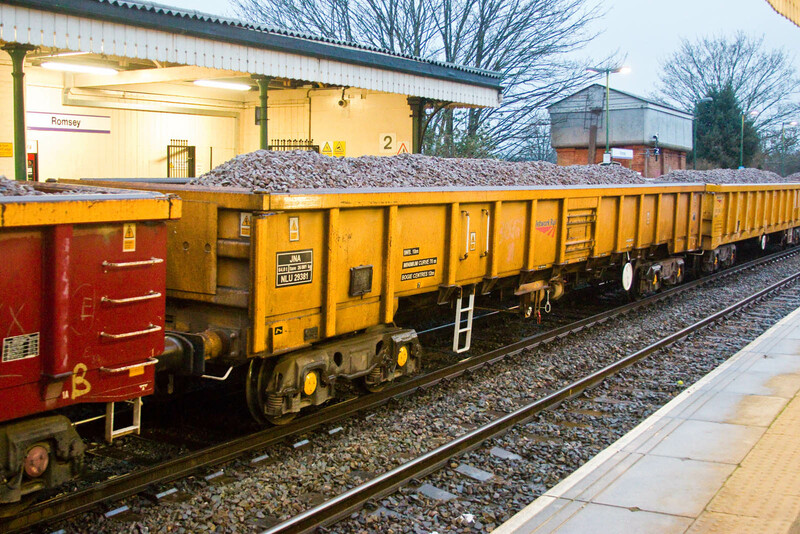 Originally constructed as an importation location for iron ore for Ravenscraig, this has dispatched coal to both Longannet, Fiddler's Ferry and Drax, the latter generating 2 trains a day in each direction over the Settle & Carlisle route. 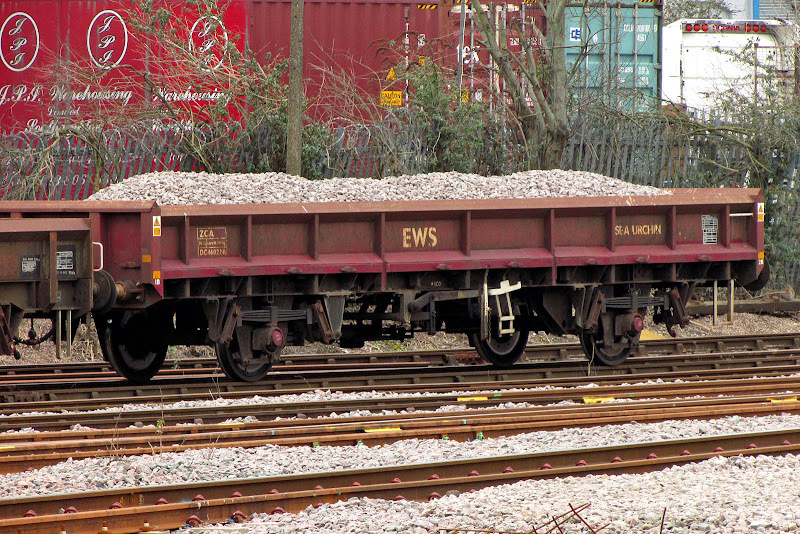 Fiddlers's Ferry also has gypsum traffic from Newbiggin on the S&C. 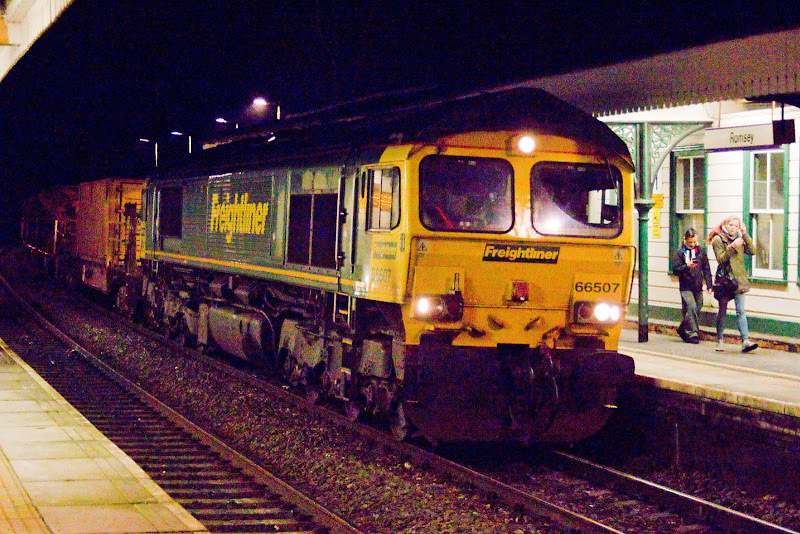 New Class 66s - the last of the line. 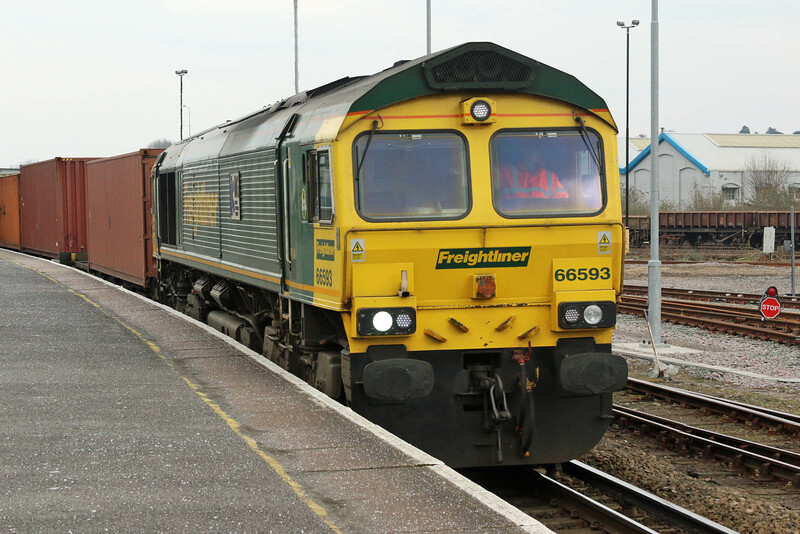 Given the above item, I suspect that more Class 66 may be exported within Europe, as some operators may have excess capacity. 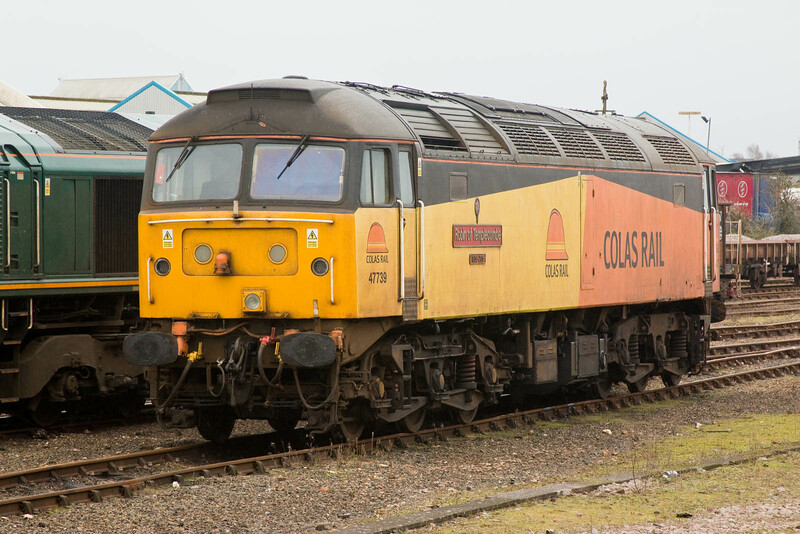 20312 has been withdrawn from the list - so that it can be used for spares for repairs on the remaining fleet, currently at Barrow Hill. 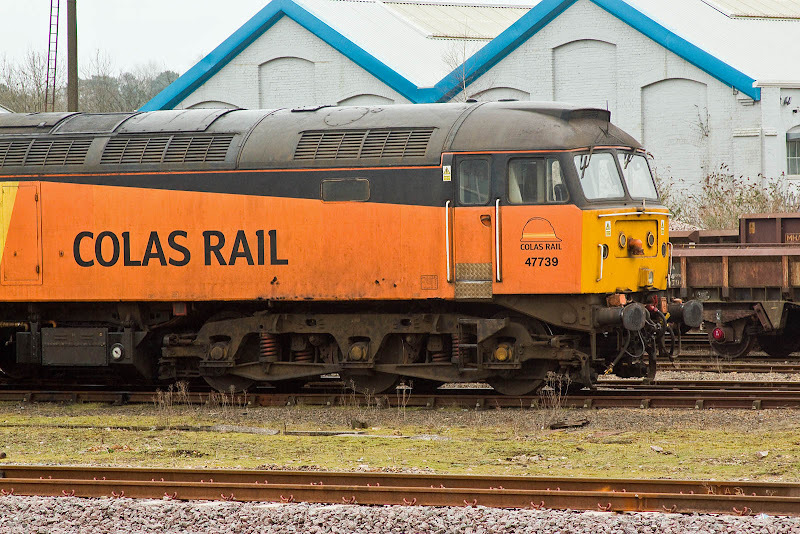 The 47s are due to transfer to Locomotive Services, where already resident 47501 is understood to have been repainted for further usage. 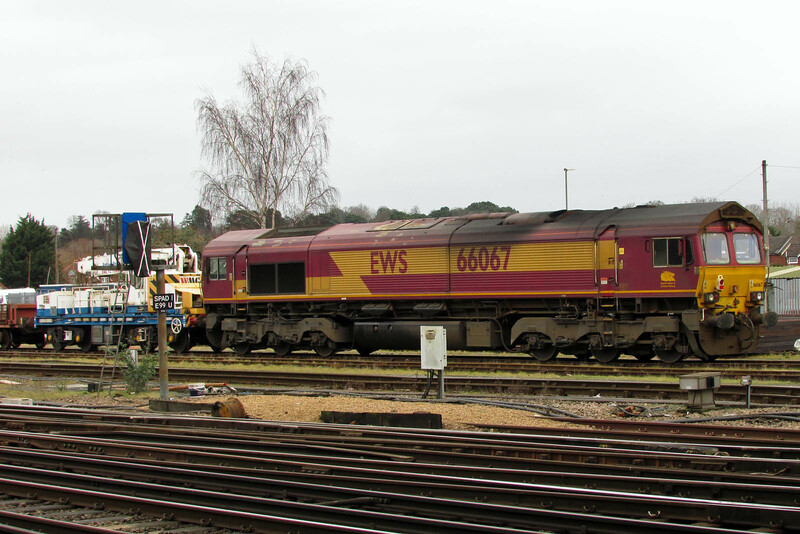 66519 had arrived at the East Yard with 6O26 from Hinksey, including 60039 in consist (not that I was aware at the time!). It then proceeded to the virtual quarry to collect a train of ballast, seen here hooked up while the train was being checked and counted. Now edging forward. 66519 is EMD 998145-14 / 2000 and is leased to Freightliner from Eversholt. 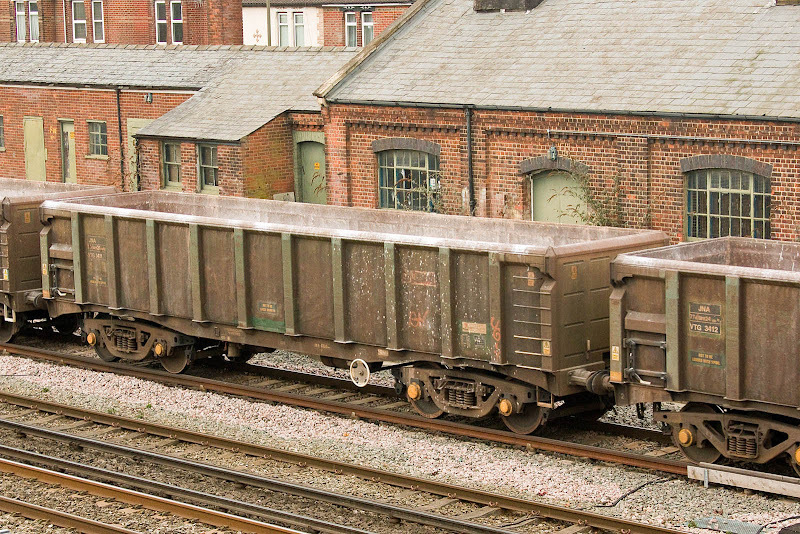 MHA 394239 an open box wagon, running on the former underframe of a HAA merry-go-round coal hoppers of 1964 - 77 construction. 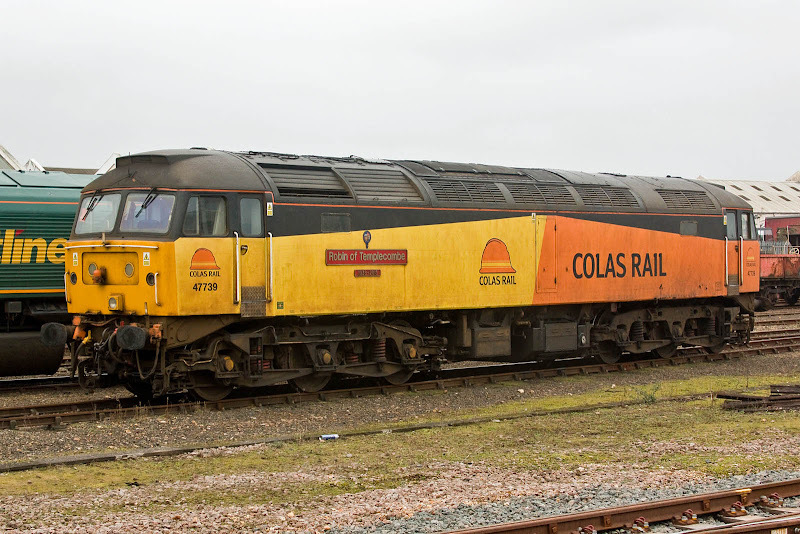 The conversion was made in 1998 at 'RFS(E) Doncaster' marked by the plate on the underframe, also marked with a disk 'Genly Repaired 1001 1 1998'. 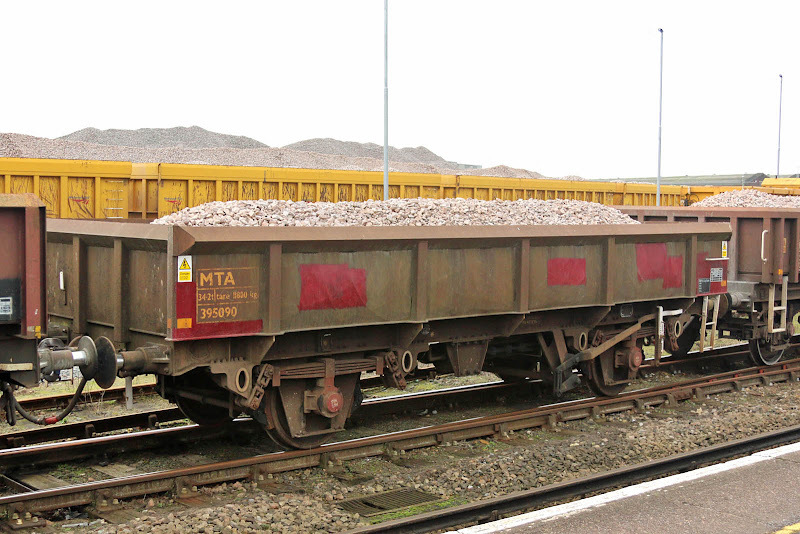 MTA 395066 is an open box wagon, converted at RFS, Doncaster in 1999-2000 and running on the former underframe of TTA tank wagon SUKO 65518. Similar MTA 395090 was TTA SUKO 65717. 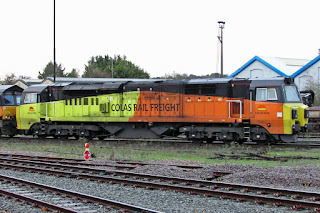 MHA 396153, similar to 394239 in being re-built on the underframe of an HAA, this time at Marcroft, Stoke in 2007, but with some visible detail differences.